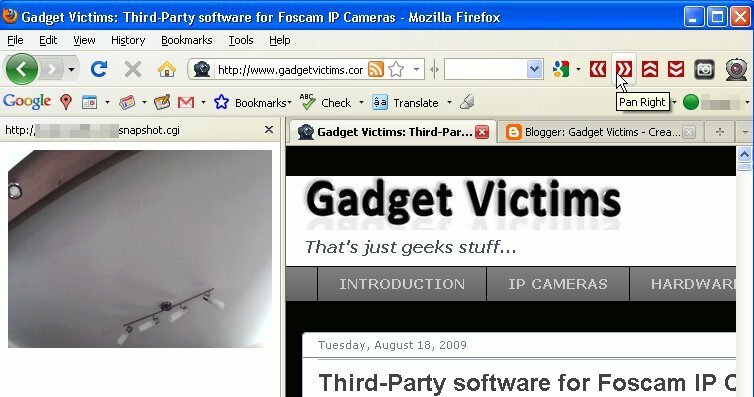 If you're an exclusive Firefox user like me, and also happen to own an IP camera (Foscam or other brand), you may also find IP Cam PTZ 1.2 (by DRZ400S) interesting. It is not yet listed in the Firefox Add-ons browser, but it can be downloaded here. 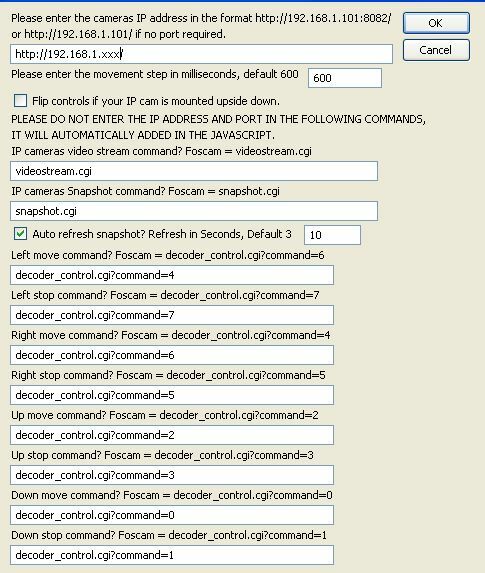 If your camera is not compatible with the Foscam command set, you should first obtain a CGI reference document from the manufacturer and adapt the options accordingly. Clicking the camera icon will open the browser's sidebar and display the video streaming from the camera. The PTZ commands are present as well as a snapshot button which can be set to auto-refresh every given number of seconds! Feel free to post your comments and suggestions on the author's page or here. Cheers Bubbah .. I'm 95% through the next addition. Basically, a new feature on the Snapshot button, you can either choose to have it displaying a single snapshot on click, or it'll automatically refresh the snapshot every X seconds (X seconds set in options). The idea is you can leave it running without battering the PCs internet connection / CPU load, like leaving the video stream does. Hey Bubbah, Version 1.3's released, you can have have it working as it used to, or set it to auto refresh the snapshot every X seconds. Video button remains unchanged. I also really recommend the username & password are included in the URL strings. 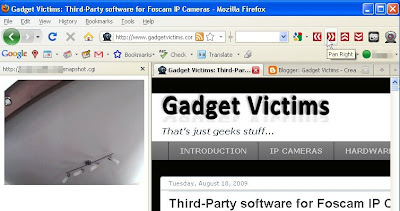 Foscam is in the following format. Nice update really, that's quite complete now. Of course, the next thing that comes to mind is the multi-camera support but that would result in too many controls on the navigation bar. Unless maybe one toggling button to swap from videostream to snapshot, and one unique button to toggle from camera #1,#2,#3,...? By the way, it seems that with your default settings you swapped left and right commands. Version 1.4 uploaded with the default options set as per the Foscam SDK. Thanks for pointing it out, Bubbah!! It won't overwrite your preferences so you'll need to set the options back to as per the SDK. 0=Up, 2=down, 4=Left, 6=right. Also Firefox keeps wanting me to open videostream.cgi and save it. Until then, I suggest you could use the snapshot with auto refresh. To uninstall > Tools > Addons > Uninstall. Thanks DR, that'll work just fine. Yes preferences don't get deleted when you uninstall an add-on. This is a feature of Firefox but I'm not sure why. I find it quite handy that it doesn't though. Just fitted a 2.1mm wide angle lens, Now that's an awesome upgrade. I seriously recommend it and only £5 from ebay. The choppy video stream is caused if you view the video over the internet, PC > Router > Cam is fine. Absolutely fantastic! Just bought my first IPcam a week ago and stumbled across this add-on on this site entirely by chance. My wife loves it as she works from home and can keep an eye on the front door for visitors or package deliveries. I got so excited, I grabbed our two old Android G1 phones (one with a misbehaving touchscreen) and downloaded an app that turns both of them into a fixed IP cam. Now she's complaining she want to be able to view both cams at once so she can watch the door and watch wildlife in our backyard. I desperately need multi-cam support now! Hope you are still working on it. This is a fantastic firefox add-on! DRZ400s...any chance of porting this to Google Chrome? I will port it to Chrome eventually! another really cool add-on really! The only improvement I can think of would be a scheduler to set a time to stop the recording. Cheers Bubbah, the problem we'd have with a Scheduler is that Firefox isn't always open. Why would you want a scheduler? it'd probably be easier & better to do it in a c# or VB application. I was thinking of it as a way to avoid accumulating unneeded pictures if I forgot to stop a recording (My browser is often left often for most of the day). You're worrying about disk space too much, Running at 1 image every 10 seconds, for a Foscam (full resolution) it's only 16 meg an hour, practically nothing to modern computers. Also, when you start it, it overwrites the old images if you use the same folder so you don't have to worry about filling your disk. Have a play with it and see what you think. Hi, Phil, sometimes it keeps asking me and bringing up a file save dialog to save the CGI stream one other user reported this above. Anyone else see this. The video stream is smooth for me. I have no problems with it other than that. It's so infrequent it's not really a problem (and I can't stop it), just click cancel, it's Firefox doing it as occasionally it thinks its a datastream. Even if you run the videostram URL through Firefox without the add-on it does it occasionally. I use the auto refreshing snapshot 99% of the time set to refresh every 3 seconds. So a girl I know at work I helped her set up her Foscam at home which works fine but then I was showing her this firefox plugin and after setting it up for her I felt bad because it doesn't have any way to protect it from people looking up password login so I guess my next request would be a password protected login for the app so you couldn't see the setup page at all and you would have to log in every time to use it. That way she could still use it at work and not worry about someone spying on her when she is at home. That's for the next release (don't want to bother the FF mods with a change to one line of code), are you the same Stephen that emailed me about it, if it was, I modded a version and emailed it back. incidentally, I bought another FOSCAM, converted the addon to work with dual cams, using the same controls (in code), one cam works fine, the other has the left / right reversed (up/down's fine), even though they're 100% using the same URL commands. If anyone else notices this, it can be fixed by the user reversing the commands in the options. Is there's any demand for the dual cam addon? Shall I release it officially? I've just come across this and love it, I for one for love to see a multiple cam version. I hope that you can find time to update this plugin to work with Firefox 5.0. I really love this plugin and find it extremely useful so I sure hope you can find the time to update it, thanks a lot. I would be happy to send a donation if it will help. Thanks, I see you updated it. Very nice.